ooc: Can he fire two arrows and then go back inside? OOC: Sure. But if he only takes one shot, he can close the door behind him. If he takes two, the door stays open. Pogsley wildly discharges an arrow back in the general vicinity of his attackers and then goes back inside and shuts the door. "Haha!" he says, spitting out blood. "They really hate Pogsley's hat!" Also, someone roll init for the round proper. "They really hate Pogsley's hat!" Thanks to his attention-getting hat, not to mention attention getting arrow wounds, all eyes are Pogsley. The Bell and the Bone goes quiet. Momentarily. Even the elven band stops playing. A faint smile hovers over the lips of the masked singer. Then the patrons begin to bring the ruckus. Shouts. Screams. Most beating a hasty retreat out of what used to be the nave, towards the doors to the apse where the kitchen is. A few hardy souls brave the narthex and the front door. Leleilana stands, grabs her shield, and shelters Homily behind it. "I'll get the child to safety. If we get separated, I'll drop her off at the temple of the giant lazy god." "Noooo!" says Homily. "I want to fight bad people". OOC: you get the jump on the crowd -- and the people trying to kill you. What now? ooc: I don't really have a good understanding of our surroundings and where enemies are. Would a map be possible? OOC: sure -- I'll try to make one today. ooc: although, I have some fears that we may need to wait until we can meet up, as I'm not sure Pogsley and Web'r can do this without Beningus and Nameless. But we have the strength of ten, because our hearts are pure and our brains are empty! OOC: it's probably a good idea to wait until next session to resolve this. Pogsley's hurt, it's clear you're being ambushed, and I'd wind up playing half the party. But I'll still make a map! It gives me a reason to mess around with my new sketchbook app (which I bought for D&D mapping purposes). Also, how do you guys feel about me reminding you of the assets your character's have (like items)? The traditional AD&D DM is supposed to keep his mouth shut. If his players aren't desperately scanning their character sheets for every last advantage, he's doing something wrong (and the players should die). On the other hand, we're busy adults, have lives, play every couple of weeks, etc., etc. etc. I don't want to spoil the, ahem, pristine AD&D experience being offered. But the AD&D DM was frequently a prick. I'm fine with that as well -- my brain don't work as well as it used to. 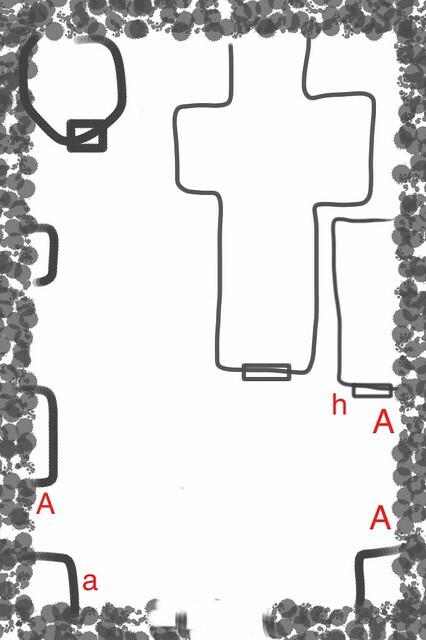 OOC: here's the map. The inn sits in a courtyard surrounded by a partially-destroyed 15' high curtain wall. The cross-shaped building is the inn. Next to it are the stables/kitchen (how sanitary!). The crude circle is the bell tower. In various places along the outer wall are various wooden storage buildings. The uppercase red 'A's are archers on top of the wall. The lowercase 'a' is an archer on ground level. The lowercase 'h' denotes a bunch of small heat sources on the ground. This walled-in courtyard is one of several in the Blastcastle district, which was once a giant, sprawling fortified complex. This courtyard houses peddlers/merchants during the daylight hours. The main castle building is nearby, and serves as an apartment block. There's an outer wall that's almost completely ruined -- refugees in the Port have been harvesting stone to build with for years. OOC: so, do you still want to wait until our next face-to-face session, or do you (all) want to bravely forge ahead?